Is the Proof in the Pudding With the Latest Play’n GO Slot Baker’s Treat? 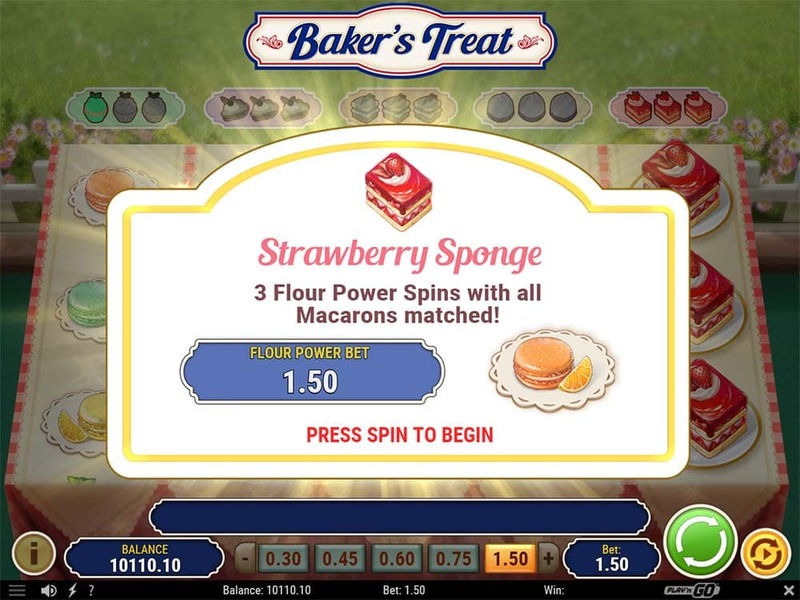 Vera and John Casino has just added a brand new Play’n GO slot to their casino titled Baker’s Treat which is a cooking-themed title based on a British kitchen packed with a variety of edible delights to enjoy. Baker’s Treat uses regular 5×3 reel layout with 15 paylines that pay in both directions and a variety of cooking-themed bonus features that include Flour Power and a Bake Off Bonus Round. Above each of the reels, you will notice some special collection meters with a different symbol on each which form the main Cake Collection feature, to fill up these meters you simply need to land 3 of the same matching symbols during base gameplay on those reels which then triggers that particular Flour Power bonus. With 5 different Flour Power bonuses, you can expect bonus modifiers such as Synced Reels, Wild Reels, Expanding Wilds, Symbol Upgrades being added to reels once triggered. 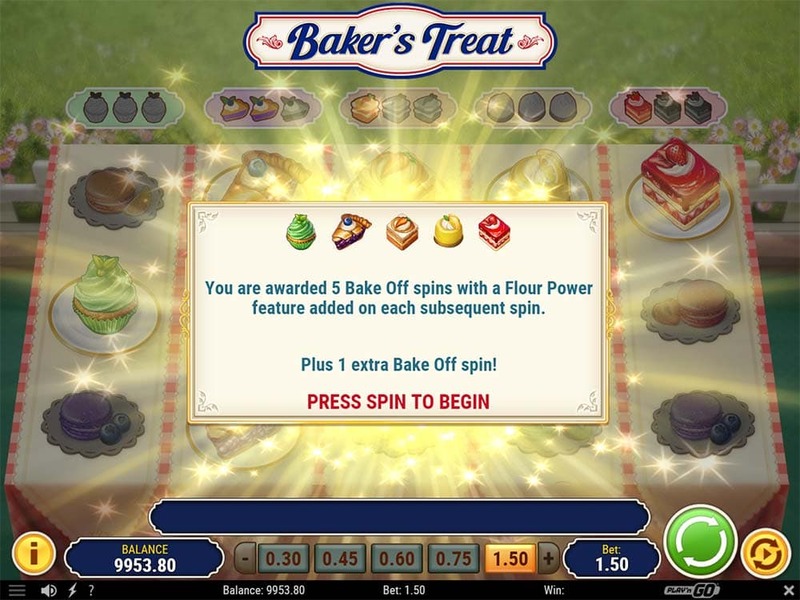 The main Bake Off bonus feature is triggered by landing all 5 of these special symbols on the correct reels during one spin which grants 5 free spins were all the Flour Power features are consecutively added to the reels one after another during the bonus round which can lead to some really interesting and rewarding results. Once any of the collection meters above the reels are filled the associated Flour Power activates, these grant special modifiers to the spins as follows. Cupcake – 3 free spins with 2 reels are synchronised. Blueberry Pie – 3 free spins where 1 reel is fully Wild. 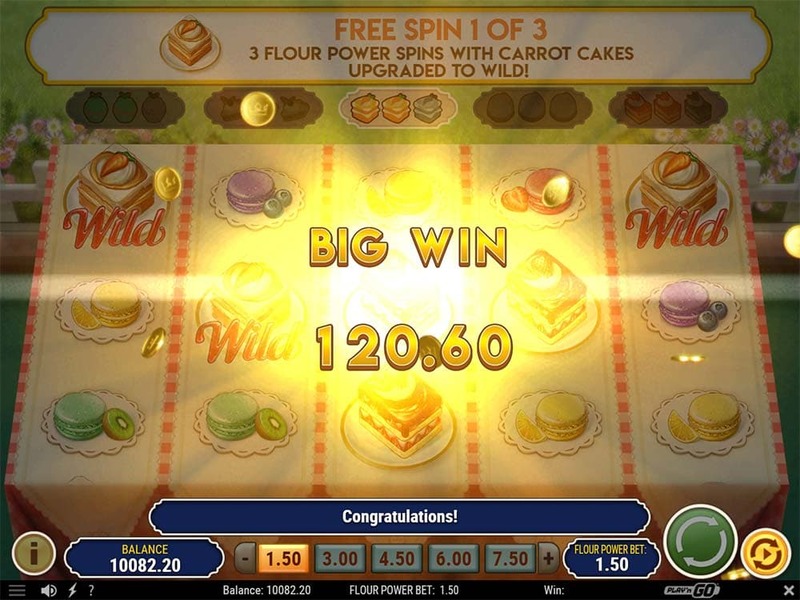 Carrot Cake – 3 free spins in which all of the Carrot Cake symbols are upgraded to Wilds. Lemon Cheesecake – 3 free spins in which wilds that land on the reels will expand to fill the entire reel. Strawberry Sponge – 3 free spins were all low pay Macaron symbols are changed into 1 symbol. The Bake Off feature is triggered by landing all of the special Cake symbols on the reels that match the collection meter symbols during 1 spin. 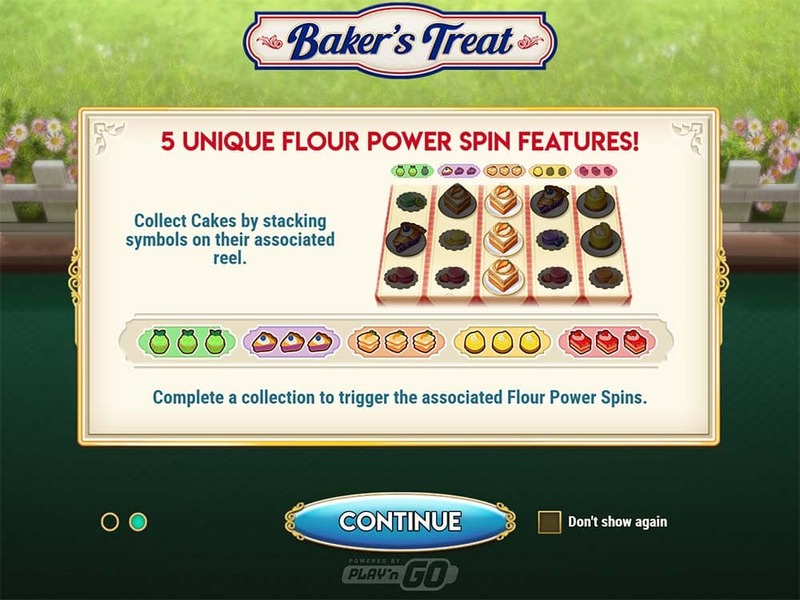 During this main bonus round, each of the Flour Power features is then added in order to the remaining spins of the bonus round, so by the final spin, all 5 of these modifiers are active. 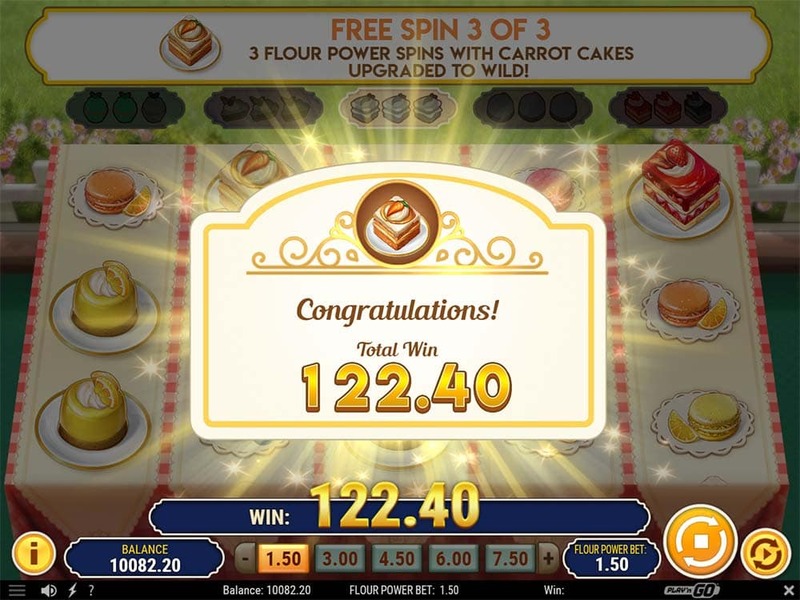 You can also earn extra spins by landing a full stack of cakes that match the collection meter on the reels granting 1 extra spin at the end of the bonus round with all the bonus modifiers active. 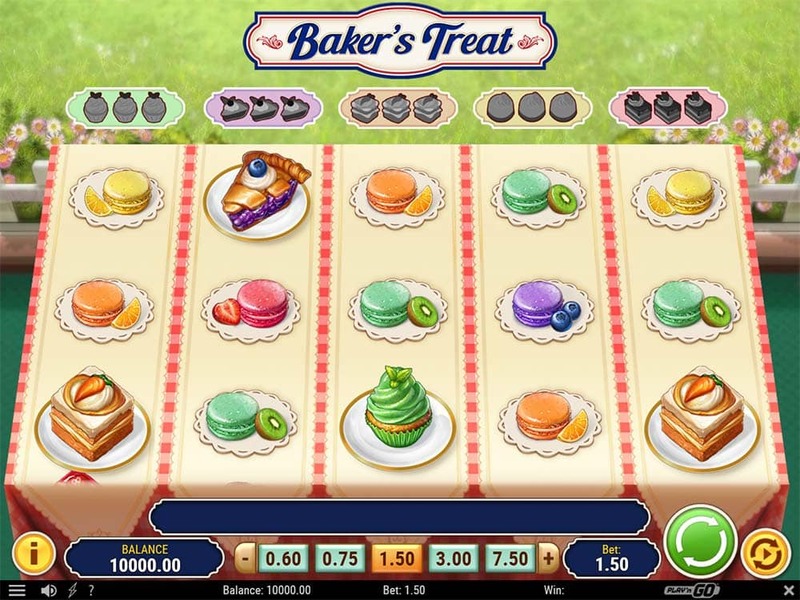 We found Baker’s Treat to be a surprisingly enjoyable slot to play, whilst the graphics are a little basic and the overall theme wasn’t really to our liking the special Flour Power features and the Bake Off bonus round really add to the excitement and combining these features together offers some great win potential and excitement. In our playtests we generally had bonus rounds wins in the range of 20x to over 100x stake with much bigger wins being capable given the sheer amount of modifiers on the final spin of the bonus round. Overall Baker’s Treat is well worth a look even if you aren’t won over initially by the design and theme.